The purpose of this article is to give a true and accurate account of the history of St. Ann's of Hampton Pipe Band, 1990-1999, and to honor the men and women who founded and helped the band to grow. Although it is doubtful that few care greatly about your "average street band," this accounting is nonetheless important to those who gave blood, sweat, and tears toward its success. Despite protestations found elsewhere, the truth, legitimacy, and completeness of this account cannot be denied. It may, in part, be entertaining, but it is not recorded here for the purpose of flattering or entertaining anyone, least of all those arrogant enough to imagine history began only after their "birth." St. Ann's of Hampton Pipe Band was founded in 1990 at St. Ann's Catholic Church in Hampton, New Jersey, under the personal patronage of the church's pastor, Fr. William J. Hewitt. Fr. Hewitt had previously been behind the formation of another pipe band, Trinity, which is now defunct. The original turnout for early band practices, which were held in the church basement, was quite large, numbering approximately 15 people. Among these early players were Hugh "Scotty" Holden, Bernie Gallagher, Jack Devanny, John O'Rourke, and Bill Greenhalgh. (Bill was the artist who designed and drew the band symbol seen to the right. The version shown here was "colorized" by Michael Bell.) One of the early members was dubbed "Mozart" due to his youth and musical acuity; however, Mozart apparently gave up on the pipes before moving on. This fairly impressive turnout quickly faded to a much smaller number, and it is a miracle that the band survived in its seemingly perpetual learning state. Actually, it is a testament to the faith of Fr. Hewitt and the persistence of the band members and its first instructor, Joe Keely. Joe Keely, who at that time was in the NJ State Police, was the founder of the Pipes and Drums of the Blue and Gold, the state police band, and played with CuChullain Pipe Band and the Leatherneck Pipes & Drums, among others. Later, he helped launch, and was the Pipe Major of, the Police Pipes and Drums of Morris County. Although the attending members were required to pay a nominal fee for their lessons, this was not always sufficient to cover the cost of the instructor's time. Fr. Hewitt subsidized the band over a period of several years when at times there was a mere trickle of attending apprentice pipers. The band received a fresh infusion of players over the years as many of the original members fell by the wayside. Patty Noll, who had learned piping skills with Trinity, joined the band, as did Michael F. Bell of Hampton (1992), Dennis Ryan of Washington Borough (1993), John Ross of Lebanon Township (1993), Paul Brown of Washington Township (1993), and Pam Duhaime of High Bridge (1995). The latter five of those above mentioned, along with Scotty Holden, were those who would survive and persist at piping until the band's first parade. Amazingly, this parade did not occur until 1996. Some members of the band did play at the mass held in celebration of Fr. Hewitt's 35th anniversary in the priesthood in May 1992. Joe Keely led the contingent that played on that occasion. The other playing members included Jack Devanny, Scotty Holden, and Patty Noll. In late 1995, Scotty Holden decided to leave the band, but was encouraged to re-join after a 2-month hiatus. Scotty, who died in 1998, was a unique character who added to the fun of the band. He was born in Scotland and had emigrated at a young age to the New York/New Jersey area. In his late 60's, as a member of St. Ann's parish, he jumped at the opportunity to fulfill his life-long dream of learning the bagpipes. Despite and severe hand injury and the ravages of age, Scotty attained his dream and played in parades with the band in 1996 and 1997. He was never the greatest player, to be honest, but he enjoyed playing and socializing with the band. He had served as a Seabee in the Second World War and always thrilled his old Navy buddies with his piping at unit re-unions. The band drifted without focus through these years, until it was finally decided that the band should set a goal and push toward achieving it. The first goal set was to participate in the centennial of the Hampton Borough. Unfortunately, the band was unable to meet its goal of participating in the parade held to commemorate this occasion. Throughout this period, the band had no drum corps whatsoever, so this hampered the band to a degree in that it was clear that even if the pipes were ready, the band could not function in a parade without the requisite drums. In addition to this, the absence of a drum corps obviously does not help a beginning band with achieving unison playing. With the addition of Pam Duhaime in late 1995, the band was primed to finally get out on the street. 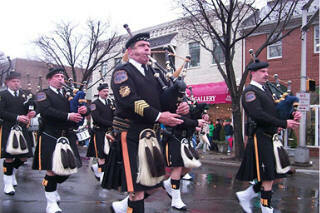 Because of Joe Keely's connections in the piping community, the band was able to get included in the order of march for the 1996 Morristown, NJ, St. Patrick's Day Parade. This goal gave the band the impetus to get over the top. Practices were well attended in January and February as the big event in March approached. The first time the band played with a drummer, Paul Wood from Rory O'Moore, was a revelation to most of the pipers. The band was wearing McKenzie kilts with Irish knit sweaters at this time. Fr. Hewitt had previously purchased this uniform kit surplus from a band in Canada. It was fortunate that this large collection of kilts, albeit well-worn, was available; otherwise, the cost of equipping the band might have proved an obstacle to the band's appearance. Pam Duhaime, a great talent with needle and thread, was instrumental in patching and altering this somewhat sad collection into presentable shape. Dennis Ryan was elected Pipe Major before the first parade by unanimous vote. When the inaugural day arrived at long last, it was a chilly but sunny. The participants in the first parade for St. Ann's were John Ross, Paul Brown, Michael Bell, Dennis Ryan, Pam Duhaime, and Scotty Holden. Fortunately for the six band members, there was able assistance provided from Joe Keely and members of the Blue and Gold and Rory O'Moore. By the time all was said and done, there was a total of about 14 pipers and 12 drummers in the "massed bands" that formed to close out the parade for 1996. The band set out on the line of march and was rejoined by Fr. Hewitt near the reviewing stand, who then accompanied it to the end of the parade, marching alongside Joe Keely. It was finally over, and there was seemingly nothing for the band to do but revel in its success. But the revelry was to prove short-lived. The band had only just begun to exchange congratulations, when Fr. Hewitt collapsed unconscious on the street, suffering a heart attack. He fell over backwards, his head hitting the asphalt with a sickening thud. Fortunately, some of the band members were well equipped to deal with the crisis. P/M Dennis Ryan and Piper Paul Brown, both of whom are police officers and EMT qualified, quickly set about providing CPR to the stricken priest, and a local rescue squad member arrived quickly with a defibrillator. Fr. Hewitt was revived and rushed to Morristown Hospital. Fortunately, Fr. Hewitt recovered and eventually returned to his duties as the pastor of St. Ann's. After retiring on July 26, 2002, Father Hewitt passed away on February 22, 2003. Our "clan chief" is gone. Like the great chiefs of old, Fr. Hewitt was a patron and lover of the pipes, and many pipers and drummers owe him a great debt of gratitude. Having made a successful parade debut at Morristown, the band went through a period of development and growth. At this time, the band agreed that it was time that it began to stand on its own and become self-sufficient. Fortunately, the band was able to do this as jobs became available and relieve Fr. Hewitt of the economic burden he had taken on. With money to deal with, the band was in need of a treasurer. John Ross grabbed a firm hold on the purse strings on his own initiative, set up a band bank account, took care of tax reporting obligations, collected dues, and generally managed the band's money in an outstanding manner for the next three years. As payment of rent for the use of church facilities, the band agreed to play at Christmas and Easter masses, and other important occasions. For instance, Michael Bell and Dennis Ryan played pipes during the church's May crowning festival. The band also usually sent a contingent to the church's annual picnic in July. Michael Bell initiated this practice, making a solo appearance in 1996. To remedy the absence of a drum corps, four homegrown students began to study the drums under the tutelage of Paul Wood. Debbie Ryan, the wife of P/M Dennis, became the band's bass drummer in short order. Dennis' daughter, Meghan, began learning the snare drum, as did Kathryn Ross, daughter of John, for a time. Charity Duhaime, Pam's daughter, took up study of tenor drumming under Deirdre Keely, Joe's daughter. New pipers who had impact on the band were Rudy Bescherer, a talented future med student from Washington Borough, and Patrick Ryan, the Piper Major's son. A few former members drifted in and out for short periods, most notable of whom was John O'Rourke, who had played with the Lehigh Valley Pipe Band under Scot Walker. His daughter, Liz, also attended for a month or two. Rudy B. quickly caught on to piping and even built his own set out of PVC tubing, much to the chagrin of the traditionalists! He later took lessons from Scot Walker and left the band when he went off to medical school in South Jersey. In March of 1996, Piper Michael Bell posted a band website on the world wide web. This site gave the band a great deal of publicity and brought in probably at least a dozen perspective pipers and drummers over its life span, not all of whom, of course, went on to become active pipers. It also lead to several band job offers. The next big event for St. Ann's was the 1996 Fourth of July Parade in Washington Borough. Pam Duhaime sewed kilt shirts in a "Jacobite" style for this event. Joe Keely did not play with the band for this parade, although he still served as the band instructor. The drum corps consisted of Paul Wood again from Rory O'Moore and Debbie Ryan on the bass. Following the parade, in what was to become something of a tradition, there was a barbecue hosted by the Ryan family, only a short walk from the end of the parade route. Earlier in the same year, in May, the band had also played at Hunterdon Central HS in Flemington, NJ, at the opening of a rescue squad convention. The Pipe Major performed a well-played solo of Amazing Grace, and was joined in the second part by the rest of the band. Following another successful appearance at the 1997 Morristown St. Patrick's Day Parade, the band experienced some changes. Joe Keely, who had retired from the State Police by this time, was unable to make many of the band's practice sessions, having taken a new job in New York City. As luck would have it, a story about the band had appeared in a Warren County newspaper and was read by one Mike Rapp of Independence Township. As a piper of some years experience, including a stint with the Kearney Caledonian Pipe Band under Jock Nesbitt of the Piper's Cove piping supply shop, Mike quickly took over as the band's lead pipe instructor. His daughter, Erin, also joined the band as a snare drummer. Mike Rapp changed and reorganized some of the repertoire, and the band was able to increase number of tunes that was available for parades and events. Mike also eventually brought his three sons--Brian, Dylan, and Russell--into the band as pipers. The band also switched to a colorful and attractive County Lough tartan and a blue uniform shirt as its standard uniform in 1997. Pam Duhaime created blue and red flashings that accentuated the cranberry reds and sky blues in the kilt. She also created rabbit-fur sporrans from scratch to complete the new band ensemble. St. Ann's marched in a local parade at High Bridge in celebration of the town's anniversary. After the parade, the band joined forces with the Somerset County Police Pipes and Drums, a brand new pipe band at the time, in a "massed bands" performance at the town park. This time, P/M Ryan led two bands in the playing of Amazing Grace. After Dennis Ryan left St. Ann's, he eventually ended up playing for the Somerset County band. St. Ann's also played at a fire department parade in Hackettstown that year and the drum corps won a trophy in the "best drum corps" category. On Fourth of July 1997, the band was able to appear at two parades, one in the morning in Lebanon Borough, and another in the afternoon back at the Washington Township parade. In the Fall, the band made its first appearance at the John Basilone parade in Raritan, NJ. New members in this period included Maureen Halloran and her father-in-law, Frank Halloran. Maureen progressed rapidly on the pipes and served as Business Manager. She was instrumental in gaining a number of important jobs for the band, including the Somerville parade and the Scottish Festival discussed below. Frank Halloran left after about a year to join the Essex County Police and Fire Emerald Society Pipes and Drums. Robbie Robertson (no, not the one from The Band!) from Raritan Township also became a member of the band during this period. His father was a piper who had taken Robbie to many a Highland Game as a youngster. As youngsters are wont, he was contrary to his father's efforts to get him to pursue the pipes in his early youth. When he took up the pipes in earnest, he learned quickly and was outstripping most of the band in playing ability by the time he left to join Pipeline Pipeband. His father's contacts helped him secure an old set of silver pipes for a very nice price. The year 1998 proved successful under the continuing leadership of Pipe Major Dennis Ryan. The band continued to play a full schedule of parades and also added the PNC Arts Center Scottish Festival in October to its list of accomplishments. The band participated in massed bands in the morning and afternoon, along with giving a St. Ann's-only performance around mid-day. New pipers who appeared at this event included Ciro LoPinto, Jeff McCarthy, and Pat Callahan. McCarthy and Callahan did not take long getting up to speed and playing with the band. They showed their dedication by taking private lessons with Mike Rapp. Ciro LoPinto, though he had never played the pipes before joining the band, brought a wide range of musical experience to the band. He already played guitar, banjo, bodhran, and accordion in the local bluegrass band, Buffalo Hollow. Later, he was a founding member of a Celtic music group, where he also was able to employ his new skill on the pipes, utilizing both the Highland pipes and John Walsh Shuttle Pipes. Ciro is also known to strike up the pipes at reenactment gatherings, including one at which he piped in the groom at a wedding and received his fee in actual 18th century coinage. St. Ann's also gained a Drum Major/Bass Drummer in Duncan Crannell, who would go on to assume the duties of Business Manager for the band at a later date. Duncan had previous experience in pipebands in Allentown, NJ. Patty Noll, one of the band's earlier members, reappeared during this period, having finished college at Rowan in Glassboro, NJ. During a semester abroad in Australia, Patty's living quarters went up in flames. Upon shifting through what remained of her things, she found that, of all her belongings, essentially only her practice chanter survived! Patty left after another stint with the band of about a year. Later she became a member of Pipeline Pipeband for a time. As was now usual, the band held its annual Winter Holiday Party at the Washington Borough Rescue Squad Hall. A reporter and photographer from the Hunterdon County Democrat were present at the party during the Winter of 98-99 and later wrote an article that appeared in that newspaper. About five different articles about the band appeared in the press over these years, including one on the website that appeared in the Courier News. More often than not, it is the person with the most persistence and dedication who goes from being a non-piper to a piper. Many is the person who comes to band practice full of enthusiasm and vim only to disappear within a month when faced with the long haul that can involved in even getting on to a first tune. It is not uncommon for the plodders among us to outlast the more musically talented who move on to other things; however, persistence is sometimes not enough when faced with the real challenges of life. One of the more dedicated souls who passed through the annuals of St. Ann's history was Tony Hathaway of Quakertown. He kept at his goal of learning to pipe for probably two years of so, but having started quite late in life and then suffering a stroke put a few roadblocks in his path. Perhaps he may yet achieve is goal and boldly strike up the pipes in the near future. The final year of the twentieth century was to be a somewhat tumultuous one for the band. Dennis Ryan decided to step down early in the year as Pipe Major after almost three years of service. He presided over the growth of the band and provided the necessary leadership to get the band functioning as a unit. At a business meeting in February 1999, Mike Rapp was elected the new Pipe Major. Officers elected included Pam Duhaime as Pipe Sergeant, Jeff McCarthy as Treasurer, Michael Bell as Secretary, and Duncan Crannell as Business Manager. The band played at two St. Patrick's Day Parades that year: the annual appearance at Morristown and new appearance at Somerville the day after. Morristown was a bright sunny and unusually warm day, but Somerville, on the following day, was rather wet; however, the band played well on both occasions. Unfortunately, the Somerville parade was to be the final appearance with the band for P/M emeritus Dennis Ryan; Debbie Ryan, the bass drummer; Meghan Ryan, snare drummer; and Patrick Ryan, piper. The Ryan family joined Rory O'Moore to continue their respective piping and drumming careers, and so ended an important chapter in the band's history. Maureen Halloran also left the band as an official member after that parade, but she was to appear again with the band on a number of occasions. Maureen left to join Pipeline Pipeband under her solo instructor. Michael Bell also joined Pipeline in 1999, but continued to perform with St. Ann's as well. In fact, it is interesting to note that Michael Bell appeared at every St. Ann's performance, however small, from March 1996 through September 1999 inclusive, comprising approximately 50 appearances, an unmatched record of achievement and dedication. In 1999, Michael Bell also re-transcribed all of St. Ann's music, using the Bagpipe Music Writer (BMW) program. Much of the music had been difficult to read, not to mention downright wrong in the areas of gracenote settings, note timing, etc. With the music completely re-written, learning tunes was simplified and new members no longer had to struggle with illegible and incorrect settings. John Ross also decided to leave the band at this time and join Rory O'Moore having given six years of dedication and effort to the band as a piper and as the Band Treasurer and Secretary. Along with the regular parades, the band was the sole pipe band performing at the Irish Day by the River in Clinton, NJ, in May 1999. The band was hired based on the publicity given it by its web page. This appearance was important, because it allowed the band to perform in a "concert" setting four different times throughout a lovely spring afternoon. In its first "hometown" parade, the band led the Hampton Fire Department at the celebration of that company's 100th anniversary. It was so hot on that July day, with a heat index in the 100s, that P/S Pam Duhaime collapsed from heat exhaustion and had to be taken to the hospital. Fortunately, she recovered quickly. The band also appeared twice in this year in Belvidere, NJ: Once for a Memorial Day commemoration and once for a "Victorian Day" parade. At the Memorial Day commemoration, the Marine Corps officer presiding smiled broadly when the band played the Marine Corps Hymn. New members to the band in 1999 included pipers Sharon Johnson, Michael Murray, Kerry Kohler, Dit Mosco, Jack Dooley (RIP, March 2007), and Brian McNulty. The first four pipers named came from other bands and brought piping experience with them. Kerry Kohler had experience in the bagpipe competition circuit with the Lehigh Valley Pipe Band under Scot Walker, and probably had the best fingers of any piper who ever played with the band. Sharon Johnson had played with a band in Ohio, while Dit Mosco had played with a New York area band. Jack Dooley, then a music teacher at the Barley Sheaf Elementary School in Flemington, NJ, brought experience on whistles and recorders to the table. Brian McNulty took a summer course in piping through the Balmoral School and studied privately with Scot Walker at Moravian College, so he progressed quickly on the pipes. On the drummer front, Brian McCarthy took over as lead drummer, and Chris McGill joined and began to fill in at bass drum. Brian McCarthy had no experience at pipeband drumming when he joined the band; but, having formally studied other forms of drumming in college, he quickly became accomplished and a solid presence in the rhythm section. Sean Devine, a grade-school-aged lad also made his first appearance with the band on the street in 1999. Flush with appearance money, the band was able to order Argyle jackets to upgrade the look of the band. Michael Bell left the band in October 1999 to play only with Pipeline Pipeband. St. Ann's appeared again at the PNC Arts Center Scottish Festival, also in October. Brian McNulty was elected Secretary to replace Michael Bell. In more ways than one, St. Ann's of Hampton Pipe Band ceased to exist in 1999. It was replaced by St. Ann's of Hampton Pipes and Drums. The band played the NYC St. Patrick's Day Parade on March 17, 2000. UPDATE, 15 Oct 2009. Perhaps I should not be surprised, but I received an email dated 12 Oct 2009 from the current leader of "St. Ann's of Hampton Pipes and Drums." He requested that I take down this site because, "It's going to confuse folks looking for band updates and information on St. Ann's." I respectfully declined, especially considering that the band's site does not mention anything that happened before 2001, save the band's founding. He answered with a veiled threat, "OK - I asked - now the next step." Somehow, I do not think that Fr. Hewitt would appreciate his "efforts." In remembering some of the personalities involved with St. Ann's in the period discribed, I was surprised to learn today that Fr. Garrett J. Fitzgerald, Assistant Pastor with Fr. Hewitt, and friend to the band, died on March 16, 2006. May he rest in peace. UPDATE, 11 Nov 2009. The current head of the band is one clever fellow. His idea of a "next step" to deter web searchers from reading this page is to plagarize the HTML meta content from this page; namely, " A historical account of St Ann's of Hampton New Jersey (NJ) Pipe Band" along with keywords. Amazingly creative and original stuff. Copyright © 2000-2009 Castle Dangerous. All rights reserved. Not for dissemination or other use without the expressed, written permission of the author. He never figured in the plan.